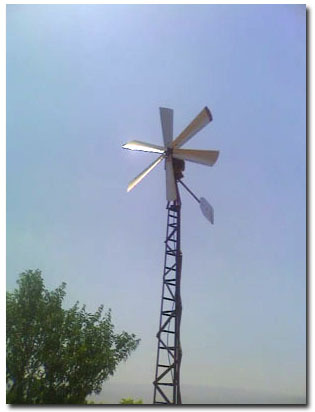 ETNA Wind energy system uses wind energy to extract water from artesian wells with high efficiency, and without any use of costly industrial energy (electricity, fuel oil, gasoline). - The device maintains the integrity of the environment, achieving global environmental requirements adopted in the Johannesburg convention. - The system can be placed as far as a 100 meters from the artesian well in the best location to benefit from wind speed and strength. - The Etna system relays on an innovative pumping method that produces compressed air that injects water from artesian wells. - Instead of turning the wind energy into electrical energy, the system transforms the wind energy directly into compressed air through an advanced compressor that in turn pumps water up and this way the system avoids losing any percentage of energy due to the conversion process. - The system works up to a depth of 100 meters (from the surface of the Earth).The percentage of extraction of water ranges between 2 cubic meters as a minimum to 12 cubic meters maximum depending on wind strength and water surface depth. الجهاز يحافظ على سلامة البيئة ، وتحقيق المتطلبات البيئية العالمية المعتمدة في اتفاقية جوهانسبرغ . يمكن وضع هذا النظام بقدر 100 متر من البئر الارتوازية في موقع أفضل للاستفادة من سرعة الرياح وقوتها. نظام إتنا والتبديلات على الطريقة المبتكرة التي تنتج ضخ الهواء المضغوط الذي يضخ المياه من الآبار الارتوازية. وبدلا من تحويل طاقة الرياح إلى طاقة كهربائية ، ونظام يحول طاقة الرياح مباشرة في الهواء المضغوط من خلال الضاغط المتقدمة التي بدورها مضخات المياه ويصل هذا الطريق نظام يتجنب فقدان أي نسبة من الطاقة نظرا لعملية التحويل. ويعمل هذا النظام تصل إلى عمق 100 متر (من سطح الأرض) ونسبة استخراج المياه يتراوح ما بين 2 متر مكعب كحد أدنى و 12 كحد أقصى متر مكعب اعتمادا على قوة الرياح والمياه السطحية بعمق.